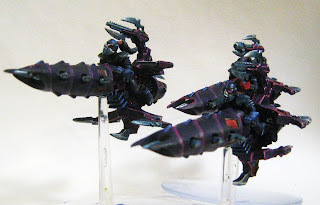 So here is the Reaver Jetbike group shots as promised, there isn't a succubus model in the group yet, although there have been a few ideas floating around in my mind for some cool conversions. Here you can see the simple blaster conversion completed by adding one of the plasma pods of a starcannon to the front of the splinter rifle. There are two more models left that need painting to complete the unit, and i have ideas for creating a second unit, or even just adding another five models to the current. I'll probably do this by purchasing a second battle force, you can't go wrong with a spare raider and extra jetbikes.